A new online tool based on data from the Colorado All Payer Claims Database (CO APCD) shows prices for imaging services at health care facilities across the state. This information can help patients across Colorado locate facilities with the lowest cost and best patient experience. With high deductible plans and health care premiums on the rise, it’s important for patients to shop for high quality health care services at the lowest cost. Coloradans needing imaging services like CT scans, MRIs and ultrasounds, now have information at their fingertips to search facilities by cost, distance, and patient experience, giving them more decision-making tools than ever before. 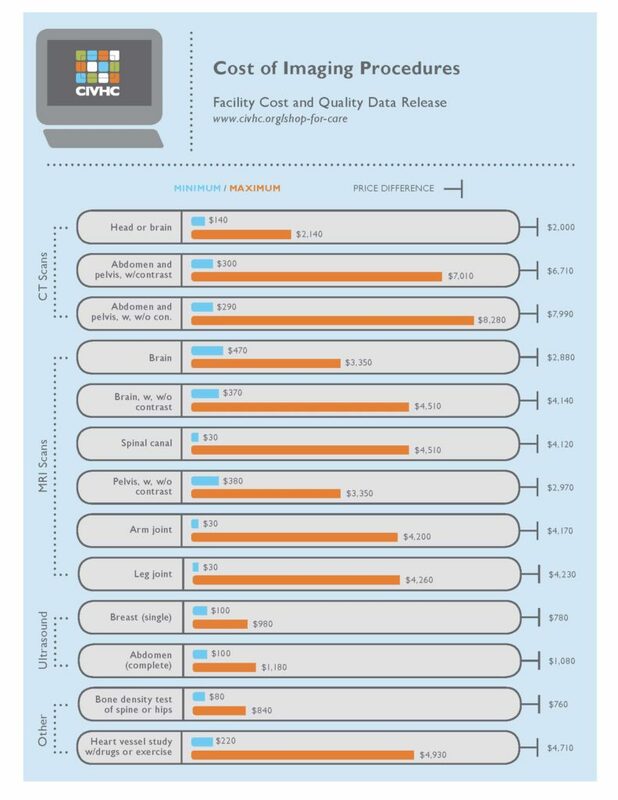 The data, made available by the Center for Improving Value in Health Care (CIVHC), shows that prices and patient experience ratings vary significantly across Colorado, and paying more does not always mean higher patient experience. Patients shopping for care in Colorado can save from $760 for bone density testing and up to $7,990 for a stomach CT scan. Prices represent median payments made in total by patients and their commercial health insurance plans, and include only facility fees. Download infographic here. Average prices in the report represent commercial payments made directly to health care facilities and include what was paid by both the patient and the health insurance company. The prices reflect the facility portion of the service only and do not include additional fees that may be charged like the doctor’s fee to read and evaluate the results. Price is not the only factor to consider when accessing health care, so patient experience ratings, which range from 2-5 out of 5 stars across facilities, are also available. Hospital 5-Star Quality Ratings were intended to be included in this release for an additional quality measure but are on hold pending Centers for Medicare & Medicaid Services (CMS) release of new information. CIVHC plans to add more searchable health care services including births and hip and knee surgery in the near future. Patients are also encouraged to access other publicly available sources of quality information and ask their health insurance company for what their specific out of pocket costs would be for the services they need. Additional statewide public CO APCD interactive reports on topics like total cost of care, quality, utilization and chronic condition prevalence are also available publicly on the CIVHC website. For more information or questions, please visit our FAQs or contact us at info@civhc.org.